I recently had the opportunity to read It Had to Be You by Susan May Warren. This is the second book in her A Christensen Family Novel series, but that did not serve as a disadvantage in reading this novel. It Had to Be You is a story about Eden Christensen. Eden writes obits for the local newspaper and spends her free time looking after her brother, who is in his first season in the NHL and learning to adapt to having fame and fortune. Unfortunately, all of this focus on her brother has left her unfocused on her life. When she gets frustrated, she starts to explore who she is and what she wants out of life. There are a few stories that are going on around Eden, that the author also does a good job of exploring...mostly to help share the stories of Eden's life. I enjoyed reading Eden's story, her journey of discovery. Susan May Warren does a nice job developing her characters and making you feel like you are a part of their family too. The strong faith of the family is evident throughout the book. The author does occasionally reference back to events from the prior story, but there is no loss in starting in at book two because everything you need to know, she shares. That being said, I still think I might go back and try to read the first one too. The version of the book that I received also has the series prequel inside that tells the story of her parents - "the love story that started it all!". I enjoyed having the chance to read their story. I found that the book was one that was easy to fit into my life and I didn't struggle to pick up where I left off, which in my life is a good thing - since reading for 10 or 15 minutes at a time seems to be how most of my reading is done. I look forward to reading more books by Susan May Warren in the future. About the book: A Christensen Family Novel. Eden Christiansen never imagined her role as her younger brother Owen's cheerleader would keep her on the sidelines of her own life. Sure, it feels good to be needed, but looking after the reckless NHL rookie leaves little time for Eden to focus on her own career. She dreamed of making a name for herself as a reporter, but is stuck writing obits---and starting to fear she doesn't have the chops to land a major story. If only someone would step up to mentor Owen . . . but she knows better than to expect help from team veteran and bad-boy enforcer Jace Jacobsen. Jace has built his career on the infamous reputation of his aggressive behavior---on and off the ice. Now at a crossroads about his future in hockey, that reputation has him trapped. And the guilt-trip he's getting from Eden Christiansen isn't making things any easier. But when Owen's carelessness leads to a career-threatening injury and Eden stumbles upon a story that could be her big break, she and Jace are thrown together . . . and begin to wonder if they belong on the same team after all. 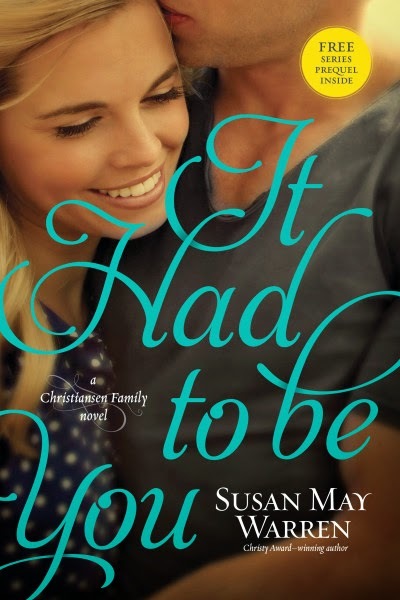 About the Author: Susan May Warren is the bestselling, RITA Award-winning author of more than forty novels whose compelling plots and unforgettable characters have won acclaim with readers and reviewers alike. She served with her husband and four children as a missionary in Russia for eight years before she and her family returned home to the States. She now writes full-time as her husband runs a lodge on Lake Superior in northern Minnesota, where many of her books are set. She and her family enjoy hiking, canoeing, and being involved in their local church. Several of her critically acclaimed novels have been ECPA and CBA bestsellers, were chosen as Top Picks by Romantic Times, and have won the RWA's Inspirational Reader's Choice contest and the American Christian Fiction Writers Book of the Year award. Five of her books have been Christy Award finalists. In addition to her writing, Susan loves to teach and speak at women's events about God's amazing grace in our lives. She also runs a writing community for authors. Visit MyBookTherapy.com to learn more. You can learn more about the author on her website. Yes, if I read I have a very short time too. Thanks for the info.